The simple rule in dynasty is if you have players similarly valuated, younger is better. Keeper leagues can be a little different given the yearly turnover, but given your league settings (120 keepers between all 10 teams), I think the format remains closer to dynasty than re-draft – as such I don’t think you should be making a concerted effort towards either end of the spectrum when it comes to selecting your players. I suppose you could lean more towards the veteran-centric side of things in the later rounds (think Anquan Boldin, Marques Colston, etc), as such players could and should offer immediate value, as opposed to lower-tier rookies you’d have a hard time keeping over the off-season (Chris Conley, Mike Davis, etc). With regards to tight ends, this one’s simple. If your FLEX positions are true FLEX positions, you should look for the guys who will score the most points, and tight ends who can keep up with receivers and running backs are few and far between. Even a guy like Rob Gronkowski becomes a likely second round player at best – there’s simply no sense in overpaying as if a positional advantage still existed. I’m right there with you as it relates to the class of 2016 (fortunately we have the Dynasty Scouts for that! ), but the fact is what we know now isn’t necessarily going to reflect what we know in 12 months. To wit, it’s not as if Kevin White was a household commodity at this point last year. Continuing, draft picks will be valuable regardless, because beauty is in the eye of the beholder, and a pick effectively represents any player you want it to be – draft picks don’t tear ACLs and get DUIs, so if a rookie player does, you simply pick another one! And as I have a tough time justifying three first round picks (I’m considering Nelson Agholor as one in this instance) for all but a small handful of players, I’d much rather stand pat here. Boy, that’s tough. I think you have to keep the trio of receivers as well as Cincy running back Jeremy Hill. The former(s) are three of the best at a position of greater longevity, and Hill certainly looked the part as a 2015 rookie. The age gap between he and both Marshawn Lynch and Adrian Peterson gives him the edge. For your last keeper I’m actually going to go with Lynch. I understand AP will go down as an all-time talent at the position, but I truly don’t believe Lynch is far behind at this point. He also plays for an offense that will often be out in front, likely meaning he’ll be featured in clock-killing mode – this helped him achieve 100 rushing yards in 7 of 19 games last year (37%, counting playoffs), which is a huge boon given your league settings. Adding in his durability (one missed game in the past four years) and I like his stability just a tad more than Peterson’s. 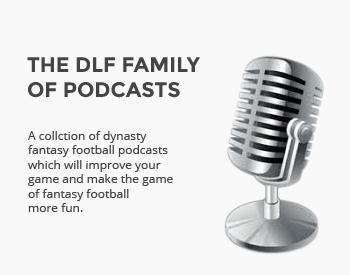 Normally I’d side with the veterans (your current players) here, but salary caps are the great equalizer, which is something I’m learning more and more every day due to our new DLF league on Reality Sports Online. It’s true both Todd Gurley and Melvin Gordon (or Amari Cooper if you change your mind) have much to prove, but the cap relief you’d see is the dealmaker in this case. Getting Larry Fitzgerald back helps your receivers a little, but given the format I think this is a deal you should take. Ironically we talked about situations just like this over the course of the past two Podcasts (found here and here), but I’ll provide you with the Cliff’s Notes here, referencing your “unique situations.” First and foremost, I’d sell Oakland running back Latavius Murray for pick 1.07 11 times out of 10 – he basically had two games against the Chiefs last season and did precious little else, including behind held under 4.0 YPC in three of the four games he received double-digit totes. Size and speed are great, but they work a lot better when you’re a complete running back, such as his backfield mate Roy Helu, who in my belief is the guy to own there. Ditto Charles Sims. I understand he was coming off an injury but he simply didn’t look special last season, and it’s my belief Doug Martin is the definitive starter and better running back. No, he wasn’t great the past two years, but it’s not as if he forget how to play the position following his stellar rookie campaign. Unfortunately, because he’s put some bad things on film he gets pushed below guys like Murray and Sims due simply to the fact they’re unknown, and therefore “exciting.” I know it’s my conservative nature here, but I’d take Martin over either every time, and think you should look to hang onto him if at all possible. Philip Rivers (QB17) – He simply goes out and delivers QB1 numbers, no matter how poor his supporting cast is. He’s only 33, so he should offer good numbers for a few more years. Colin Kaepernick (QB19) – I don’t love his talent, but I think the 49ers could be playing from behind a lot more this year. Robert Griffin III (QB23) – A better, but less healthy version of Kaepernick above. Nick Foles (QB27) – Like it or not, the Rams appear committed to him and ready to offer an extension. Geno Smith (QB30) – Hey, a guy can dream, right? Truth be told I like it a lot for you. The only guy I think you’ll really miss is Denver running back CJ Anderson, but after that you sold a lot of guys whose names are bigger than their games. Amari Cooper is likely the most valuable asset in the deal, and you also received some promising rookies in Agholor and Devin Funchess. Most importantly, Jacksonville tight end Julius Thomas is easily better than anyone you had before, while Kyle Rudolph offers upside if he can simply stay healthy in Norval Turner’s offense. San Francisco running back Carlos Hyde may be somewhat overrated, but if nothing else he currently carries significant value and can be flipped for a different asset if you so choose – all told you took some large strides towards rebuilding. Though I largely dabble in IDP as opposed to being any sort of guru, I can say from my experience I think the first option is a little too granular. While I like the idea of separating out defensive end from defensive tackle, as well as cornerback from safety, I believe linebackers should simply be linebackers. My other worry is finding a format that can distinguish between the positions (would it be simply as they’re listed, or where they play on a given play, etc). Instead of delineating that precisely, I’d choose to modify your scoring settings such that there will be a discernible difference as to why you’d roster someone like Von Miller versus a guy like Paul Worrilow. I also think you could add an additional linebacker and defensive end spot, as doing so could place a greater emphasis on the defensive side of the ball. Regarding question 3, in this format I think you throw back Hill. This number of keepers makes it a bit of a redraft/dynasty hybrid. I’d lock in the WRs as my long term keepers and pick the RBs who I think are going to be the best this year…AP and Lynch fit the bill better than Hill does. And I would go with option 3 and dump Lynch. As he threatens to retire after every year you could potentially be out 2 RBs after this year. I would consider the longevity as the deciding factor between AP and him. Honestly I don’t think there was a bad answer here. I actually think Marshawn is the second most talented RB in the league behind Charles, and I just love his durability. IF he plays in 2016 (a big if, I’ll grant you), I expect him to just keep producing. This was probably the toughest question of the week, but I truly believe Hill can be an RB1 for the next several years, which would mitigate any immediate drop-off when compared to Lynch/AP. I have managed to get the #4 pick in our 16 team 33 player IDP roster….we start just 1 QB, 1RB, 3WR, 1TE….I’ve just learned through the the grapevine that T.Gurley is gonna be there for me, but I dont need a RB…I traded CJ.Andenson to aquire the #4, I was looking to upgrade my #3 WR….I’m in love w Nelson Agholor…think he’s special. Am I crazy? My starting team is this. TE-J.Graham…..#3WR is my only weakness,defense is even more loaded than this offense. I don’t see Agholor as an improvement over ARob, but rather a lateral movement at best. Considering that he will compete against Matthews/Murray/Ertz and maybe even Huff for touches, while ARob is clearly the #1. Even though you only start 1 RB, I think you should be able to get a better player in exchange for Gurley/#4 pick. But if Agholor is your man, I’d at least try to trade down a couple of spots. I’d probably make the Watkins trade if I were the reader that was asking that question. The Bills are going to have a low volume offense with one of Cassel/Manuel/Taylor at starting QB. I really think Watkins finishes the year as a low-end WR2/high end WR3. Having talented players like Percy Harvin and Charles Clay to steal precious targets isn’t going to help his short-term outlook either. My point is, if you think your team can compete this year, I would sell now, and then buy back next year when Watkins can be had for pennies. Agholor and 2 first round picks is a really nice payload. It’s a risk, but it’s one I would consider taking. Drew in IL was offered Sammy Watkins for Agholor and two first round picks. Eric had the same position as you, he was just advising from the perspective of the value of what Drew in IL would be giving up (which is WAY too much for Sammy Watkins in his current situation, and maybe in any situation depending on where the first-rounders end up falling). Moral of the story: YES, keep the Agholor and the picks!! Yeah, I do like Sammy a lot, but he’s just not worth three first round picks. Few are! Great advise across the board Eric. Thanks MATRIX, and thanks for reading! I’d trade Watkins in a flash for those 3 1st..
Agree, but he was the potential SW buyer here, not the seller. Very few players are worth three first rounders. In question #5 you mention that you’d trade L. Murray for the 1.07 “11 times out of 10”. I was recently offered a 2016 1st for him. Same thoughts? Abso-friggin-lutely. I just don’t get the hype, and still believe Helu is the best RB on that roster. Eric, love your love for Helu! I’m with you. I’m letting people reach for Murray, and nabbing Helu as one of my late round fliers in most drafts this year. Keep up the good work. Thanks for publishing. Yeah man, I don’t understand why he’s being discounted for a guy (Murray) who’s proven significantly less. Give me Helu for less than half the price over the workout warrior.